Reader and fellow blogger Telwyn from GamingSF suggested that I cover The Red Reaper in one of my Flashpoint Friday columns. His reason? "I have fond memories of running that with a guild I had just joined back after launch." I was very surprised to hear this as I've always considered Red Reaper the red-headed stepchild among the levelling flashpoints, but it's certainly topical to talk about it right now. While Knights of the Fallen Empire introduced no entirely new flashpoints for us to play, Red Reaper is now also available in a hardmode version when it wasn't before, so it is certainly worthy of special attention at the moment. Red Reaper is another one of the six "story-light" levelling flashpoints for both factions that were in the game at launch. There used to be breadcrumb quests for all of these on the fleet, but it appears that these have all been removed in KotFE. (To be fair, the quest icon clutter on the main station was getting quite bad.) Aside from queuing for any of these via the group finder, you can also still launch them manually from your fleet's dropship launch hangar by picking up the mission in front of the respective entrance. Red Reaper is now available as a tactical flashpoint for levels 15-65, but was originally designed for a normal trinity group of levels 43-48. 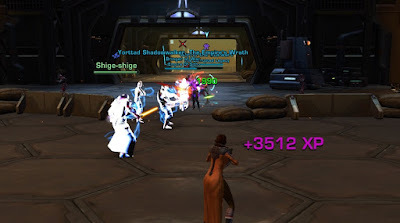 I suspect that the level range contributed to it not being very popular, as players who made it that far were often keen on pushing onwards towards the level 50 endgame as quickly as possible, and the first of the official endgame flashpoints that awarded actual endgame rewards, Directive 7, already became available at level 47. This caused Red Reaper to be stuck in the awkward position of almost but not quite being an endgame flashpoint, which wasn't helped by the fact that it was actually available in the group finder all the way to level 50. I repeatedly experienced level 50s declining to join the group when they saw someone of level 46 or lower in the setup proposed by the group finder, because they knew that the game was going to land them in Red Reaper and they actually just wanted to do a random endgame flashpoint. Red Reaper is actually a fairly short flashpoint if you know what to do, but it can feel longer than it is because everything takes quite long to die. The trash pulls are large and full of hard-hitting mobs with lots of hitpoints, which I'm sure has left many a group with nothing but bad memories of this instance. 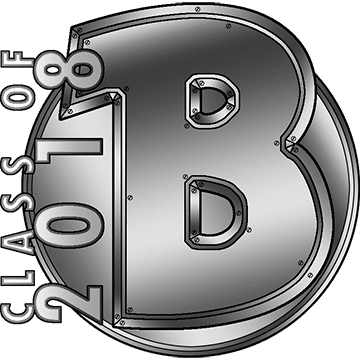 The first room is particularly infamous, because it's filled with several tightly packed trash groups that are engaged in combat with friendly NPCs. (The ship is attacking the planet Chandrila at the time, and planetary forces are fighting back.) In theory they are not supposed to cause you any issues until you actively engage each group, however many people have stories of extra mobs joining the fight seemingly out of nowhere or even of being attacked by invisible adds. 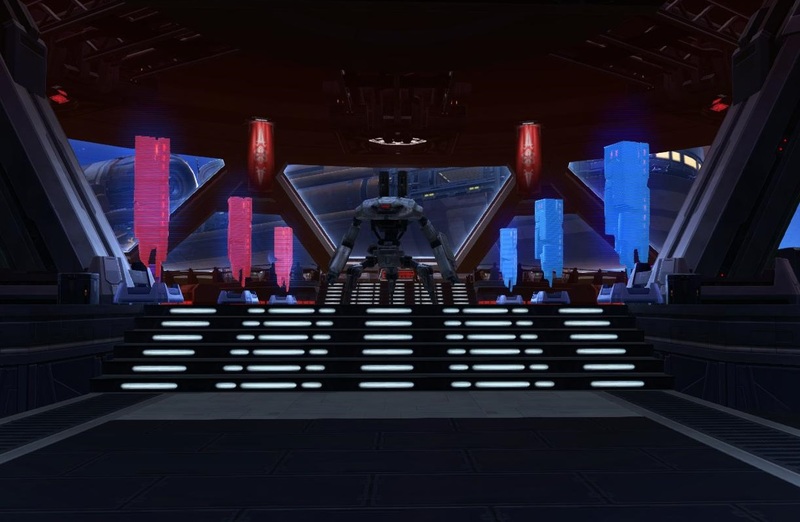 Being a Sith ship, the Red Reaper is filled with Sith, some human lackeys of theirs and plenty of battle droids. Back when the instance's level was 43-48, I knew of people who soloed it at max level purely for all the scavenging materials. Being a scavenger also pays off in a different way, as this instance offers another shortcut to skip some trash that can only be activated by a scavenger, as well as a second shortcut for which you need an archaeologist. The boss fights in Red Reaper can be summed up as "quirky, with mixed success". It is clear that the designers of these encounters were trying to create fights that would be interesting and different from what came before, but they weren't always entirely successful. The first boss, Lord Kherus, is a bare-chested Sith Marauder that leaps around a lot, throws crates at people and tries to kill some Chandrila prisoners to increase his own power. In my opinion the problem with this fight is that, if you do everything "right" by stopping his crate-throwing by quickly getting into melee range with him and interrupting his attempts to kill the hostages, you'll never actually see any of his mechanics and he more or less comes across as a tank and spank (with some jumping around). If you actually see him do anything cool, you're basically playing sub-optimally. The SV-3 Eradicator has a large group of trash right behind him which is easy to miss if you don't know about it, and they will all aggro at once as soon as the boss is dead (or if someone manages to get knocked into them). This can get really painful for the healer in particular, but if you're careful it's possible to clear all the mobs out before even engaging the boss. Shortly before the final boss there is a group of three Sith just at the edge of a narrow bridge. If you guessed that they have knockbacks, you'd be right. It is once again possible to use this setup to your advantage and skillfully knock them to their deaths if you do it right, but in practice many a pug has fallen to its own death instead. 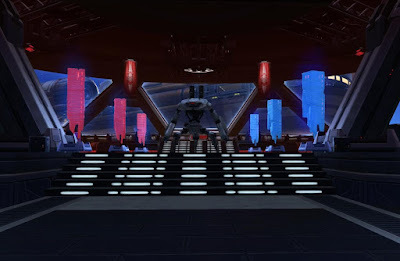 The last boss, Darth Ikoral, is the best of the bunch and actually quite memorable. Aside from a knockback and a painful dot he has two noteworthy phases: In one he summons red "power-ups" that your party needs to collect if you don't want the boss to increase in power, and in the other he summons adds that you run behind to get Ikoral to kill them with his own force lightning. (They also have to be interrupted for this to work.) It's a pretty interesting and unusual mechanic, but not so unusual that you can't figure it out while you go along - though if you're anything like my own party in my first ever run of this flashpoint, it may require a lot of running back and forth until you figure out how to get the adds killed. I've run the hardmode version only once so far, but it's not particularly impressive. It retains the same challenges as normal mode (which means a lot of painful trash pulls), but the bosses remain fairly simple. Darth Ikoral gains an extra add that roots people, but this didn't appear to cause my group too much trouble. Also, unlike Hammer Station, Athiss, Mandalorian Raiders and Cademimu, the hardmode version of Red Reaper has sadly not been enriched by the addition of a bonus boss. Whether you're briefed by Darth Malgus or Satele Shan, a rogue Sith ship called The Red Reaper is running rampant and needs to be stopped! 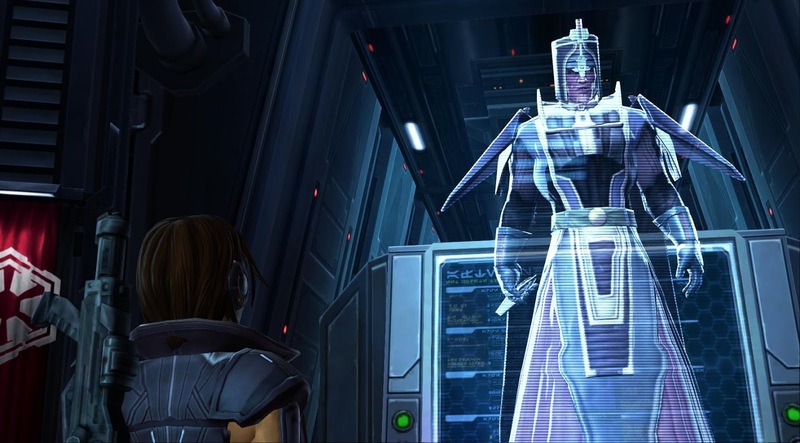 It belongs to a certain Darth Ikoral, who was once the master of Darth Malgus' own master - a sort of Sith granddaddy if you will, who is about as unfriendly as you'd expect. He left the Empire seventy years ago to search for lost pureblooded Sith and has now returned, wreaking havoc on both Republic planets and Imperial outposts. He has no interest in co-operating with the Empire anymore since he feels that it has become weak and too "diluted" by alien blood that needs to be cleansed. So... you board his ship and kill him. 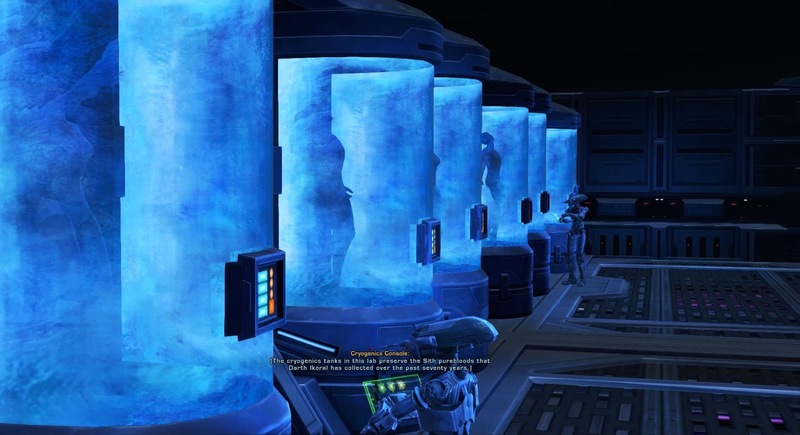 Incidentally, he also did find a lot of Sith purebloods on his journey and kept them in cryo stasis pods. You have the option of ignoring, killing or releasing them, but even if you release them they just turn hostile and attack you. KotFE also appears to have got rid of the de-briefing dialogue that you used to get after these flashpoints, probably because people considered it too much of a nuisance or something. Now people will never again know how Hammer Station fell into the hands of the Advosze! I have to admit that I personally think that Red Reaper is one of the weaker levelling flashpoints. It's not bad, but apart from the final boss fight - which is pretty fun - it isn't as interesting in terms of mechanics as some of the available alternatives, nor does it tell a very compelling story. The latter wouldn't have to be a problem, as we already discussed that there are other story-light flashpoints out there that shine in their own way, but in the case of The Red Reaper in particular, I always felt that there should have been more to it. Darth Ikoral is built up to be quite the personality, and as an Imperial you get the option during the intro briefing to say that you will try to convert him to your cause. However, when you actually meet him, there isn't an option to even attempt to talk; you can only attack. At launch he didn't even have any voice acting and attacked players in complete silence, which only added to the feeling of the encounter being somewhat unfinished. The Red Reaper is still a flashpoint that's worth seeing at least once, but to me it will always stand out as a piece of content that hasn't really managed to live up to its full potential. I only got into Red Reaper a few times due to lousy queuing --a victim of both my typical play time and that it was right around when Chapter 3 really kicks in for people-- but I enjoyed it. It reminded me a lot of Lower Blackrock Spire for some reason. I think it has more to do with the twisty, winding environment. Maybe Utgarde Pinnacle is a better association, but over time I associated UP with speed runs where people try to bypass bosses all the time.